For the last couple of years I’ve participated in Velvet’s September Zombies celebration for the month of September, and this year it’s no different. It’ll really pick up towards the end of the month, so watch out for some zombie-related content here at Adventures of Cecelia Bedelia and at vvb32reads from September 20th-30th (including a giveaway opportunity!). Also in the near future: BBAW, or Book Blogger Appreciation Week. BBAW is in its fourth year in the book blogging world. On my blog this year’s event will feature an interview swap, daily blogging topics (if I get around to them) and a giveaway. The official dates for BBAW are September 12-16. Check in for the interview swap on September 13th! 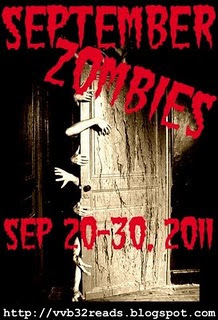 Tell me: are you participating in September Zombies and/or Book Blogger Appreciation Week? I'm participating in September Zombies. I'm doing a guest post on Velvet's blog and also posting on my own blog every day in September about something zombie. I'm looking forward to your zombie stuff! wooot! looking forward to yours.